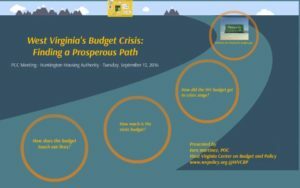 » The West Virginia Budget Crisis – How Did We Get Here? How Can We Get Back on Track? Blog Posts > The West Virginia Budget Crisis – How Did We Get Here? How Can We Get Back on Track? Years of shrinking funding have undermined West Virginia’s most important public investments, such as higher education. The state now faces another significant budget shortfall next year that could result in more unaffordable spending cuts that continue to erode core public services that provide a foundation for prosperity in the state. Unless lawmakers act, the state will continue to underinvest in its workforce and infrastructure and diminish its ability to provide long-term economic growth and improve the health of its communities. How did we get here and how can we get back on track? Follow along in this presentation by Policy Outreach Coordinator Tara Martinez.